This article is solely dedicated to a dog food brand called Zignature. Since it’s quite comprehensive and elaborate, we have made a table of content for your convenience and simplified navigation. HM tip: Before we dive into further details, we suggest you getting familiar with the topic desribed in the article about appropriate HP-LC diet, supplemented by the article of feeding schedule for dogs. They will serve as a great starting point and knowledge background on how to look on the products you purchase for your dear companion and how to consume them. With that intel back in your minds, you’ll be able to evaluate any dog food on your own with a deeper understanding and not let any manufacturer or advertisement fool you. There are two reasons why we as veterinary experts decided to review this brand exclusively. For one, they claim to be, simply put, very healthy for your dog by excluding various proteins and other ingredients that are not well-suited for your pet (we talk about this in our aforementioned article about balanced HP-LC diet), and, secondly, they are less advertised than some other big brand names for which you can already find tons of reviews including some honest ones (still, we might take on some of the brands after a while). Note that we go in-depth for dry food only in this article as it’s always a greater debate on how good actually a dry food for dogs can be since most companies, in reality, make them from cheap ingredients and put out loud ads to make better profits. Let’s see if that’s the case here. Zignature dog food is produced in US. The meat they use for their products comes from different places of the globe since there are certain recipes that may require something that simply cannot be found in such portions or quality in the same country – kangaroo, for instance. In general, the manufacturer has produced these products with a thought of dogs with allergies and various food sensitiveness in mind, however, we will go beyond that and see how good they actually are for any dog. Bear in mind, however, that, although a strong indicator, you shouldn’t look at the number alone in the next table. Therefore, read our reviews of each product to see its real advantages and disadvantages, as well as our tips when and how to use them to decide whether suitable for your household. We will review each product separately and give our feedbacks and tips for you to decide if it’s appropriate for you. You may notice that the percentages don’t sum up to 100 in our graphs. We did this intentionally as it was important to show these 4 measurements specifically and their ratio (more or less, they make up around 85-90% of the nutrition value). We go in-depth for 5 best Zignature dog food formulas in our opinion. By best, we mean either ones that were the most appealing ones, serve a certain purpose (is good for skin inflammation, etc. ), or simply is the best overall. Let’s start with the most interesting one, at least for us, anyway – Zignature Kangaroo Formula. The meat used in this product comes from Australia (makes sense, doesn’t it?). Right off the bat, we can excel this product for containing almost no saturated fat. It’s rich in various vitamins B and in iron, also containing important Omega-3 fatty acids. Just like other formulas, this one really doesn’t contain any chicken meat or its by-products, as well as any grains. We won’t put this as an advantage over other products in the list, as none of them contain these. Similarly, we won’t put each time in the disadvantages section the fact that all formulas possess selected portion of veggies or fruits – that’s something that’s common amongst dry dog foods, and Zignature actually excels in terms of how little (and what exactly) they put from this sort. The main drawback we found – it’s just a bit too high carbs… At least for an average dog. Yes, the protein the kangaroo meat provides is actually second to none, which is crucial to any carnivore, however, the amount of carbs this formula possesses (obviously, it’s not just the meat, but also chickpeas, sunflower oil, flaxseed, and other ingredients) makes us question you – would you be able to balance it out with other foods, and, in addition, could you provide enough workout activities/exercises for your four-legged friend to stay in shape and also have a good enzyme system? HM tip: Consider this an excellent nutrition supplement if 1) you also provide other product much lower in carbs, 2) if you exercise your dog on daily basis. This doesn’t mean a couple short walks per day – this means athletic activities, such as hiking, running, water activities, playing games, etc. If that’s the case, Zignature Kangaroo Formula can actually prove worthy because of the vitamins and other qualities it possesses. Zssential formula isn’t as mysterious as it sounds – the reason behind such luxuriant name is that it’s multi-source protein recipe – turkey and turkey meal (US), salmon (US), duck meal (France), and lamb meal (New Zealand). Just like our previous pick, Kangaroo formula, this one is full of Vitamins B and Omega-3 fatty acids. Not so rich in iron, though. However, this formula is supplemented by blueberries cranberries meal which are rich in antioxidants. Simply put, it will somewhat support your dog’s immune system, and also help to fight off various diseases. In general, we wouldn’t recommend adding fruits to your dog’s menu, however, this definitely isn’t the worst case and has some positive value, too, as mentioned before. The good part about this formula is that it is a bit richer in protein and less in carbs compared to Kangaroo formula. Overall, as you can see, Zssential formula is closer to an optimal breakdown of protein, carbs, and lipids (fats). Yet, we would suggest some additional meal high in protein but more importantly – very low in carbs. HM tip: Consider this one of the best choices on the market today for an average to a very athletic dog. As indicated before, ideally, we suggest some other natural protein source that is extremely low in carbs – then it’s an excellent combination for a healthy dog that can be strong both outside and inside – have an athletic build and great immune system. If your companion likes the taste, the aforementioned combination is near perfection. Trout and Salmon Meal Formula, as the title indicates, is fish-based. Some dogs love it, some – not so much. However, what is certain – it keeps your dog’s coat shiny thanks to the salmon oil it contains along with flaxseed and sunflower oil. The salmon oil also prevents inflammation and excessive weight gain. While it’s relatively high in protein, it also surpasses the recommended portion of carbohydrates – 38% (chickpeas, peas, and others). Therefore, the same recommendation for other low carb sources of nutrition applies. Just like other aforementioned formulas, it’s got Omega-3 fatty acids and Vitamin B12; Additionally, it has some important antioxidants for a better immune system. HM tip: It’s an excellent choice if your four-legged fella is naturally prone to inflammation and unwanted weight gain (better in combination with some extremely low carb products). Also, if you cherish your companion’s coat, this formula will help it look really magnificent – the difference will be especially noticeable on long-haired breeds (bear in mind you still have to take care of that by grooming appropriately – we suggest to read the article on Why and how to groom your dog. Unless your dog has an allergy to lamb, this is an excellent choice for sensitive stomachs. Another good feature this formula entails is a very rich content of Omega 3 that can really help dogs with joint troubles and skin allergies. The main drawback we found – again, it’s relatively high in carbohydrates. Once again, if supplemented with other low carb nutrition, can be a very satisfying addition to your dog’s menu. This product doesn’t lack iron, is rich in Vitamins A and B12, also possessing a fair amount of zinc, copper, and selenium, as well as niacin and riboflavin which is essential to metabolic energy production. Overall, the formula is decent for active dogs, and useful for long-haired breeds because of the excellent features in this regard. HM tip: Lamb Formula can be a great novelty for some older dogs with joint issues, as well as for dogs with skin allergies. If your fella falls under these categories, make sure to try out this product immediately (unless your dog has an allergy to lamb, of course). Frankly, one of our favorites, and for good reasons. Zignature Turkey Formula is high in quality protein as it is a good source of the aforementioned riboflavin that is essential for the production of metabolyc energy. It’s also high in omega oils and low in saturated fat. It is also of the best choices for joint stiffness and skin inflammation. While it’s the lowest in carbs compared to other products we’ve reviewed so far on the list, ideally, you would still get some additional meal for your dog that is even lower in carbs. As far as the dry food industry goes, this truly is one of the best in this regard as well. This is a very limited ingredient formula, and we love the simplicity of it. Overall, would be our pick No. 1 for most active dogs (since it’s also a bit higher in fats (non-saturated)), however, there are certain factors, such as lifestyle and taste preferences (you may get a similar product in nutritional value with another flavor your companion prefers), that may us suggest another formula instead. HM tip: Consider this one of, if not the best, dry dog foods on the market today – excellent for active dogs and also very useful to ones with prone in inflammation and troubling joints (can be all three together). The nutritional value with the limited ingredient formula is second to none and, overall, our favorite (Zssential comes very close, therefore, a matter of preference in terms of ingredients), especially, for active, athletic dogs. 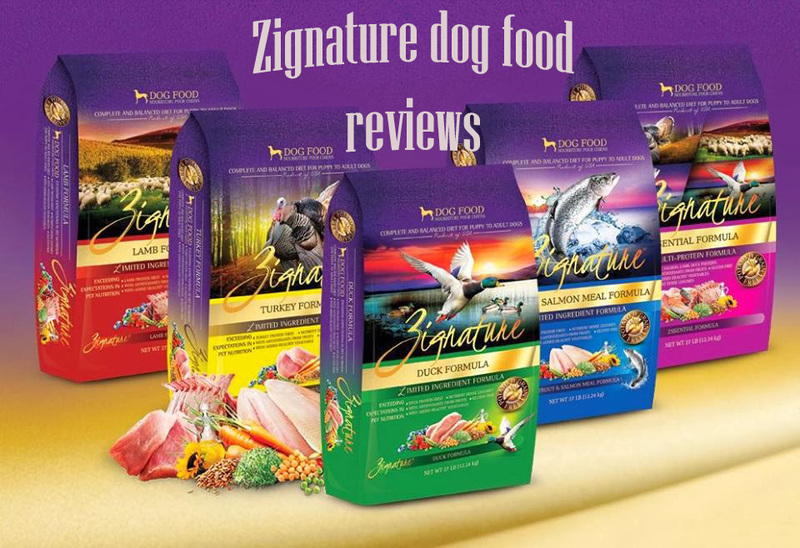 We have to admit that Zignature dry dog food has left a very positive impression of this company – they really do carefully pick the ingredients they use in their limited formulas, and most of them may have a positive effect on your dog’s health. With that being said, we’re still no fans of dry dog food and suggest you get additional nutrition for your dog that is even lower in carbohydrates. Yes, within the world of dry food, Zignature stands out and has become a favorite of ours – in the combination of natural nutrition with low level of carbs, that is. For your information, this very company produces wet (canned) dog food as well using the same base for their formulas (turkey, lamb, kangaroo, etc.) – we suggest you take a look at them as well since they are lower in carbs – in average, around 25%. You can get them from Amazon online. Note, however, that canned food has to be consumed much faster than the dry food (we’d suggest 4-5 max for Zignature formulas when opened). This is one of the main reasons dog owners tend to go for the dry food. We, taking into account the reality of human lifestyle and the interaction with their pet today, would still suggest to mix it up a bit, and provide your companion with both dry and wet food – both for nutritional value and taste (no secret dogs tend to prefer the wet food). Nevertheless, you should still find time to exercise your four-legged companion. Given our tips, if you still cannot decide which dog food would be the most suitable for your individual fella, feel free to leave a comment or contact us via email. Next articleMerrick dog food reviews – the best grain free dog food? You lost a little credibility when you mistakenly said that dogs are carnivores. They are omnivores. This mistake will confuse people who don’t know better. In this article we go into more detail. They don’t have flat molars and their jaws only move up and down, not side to side. That means carnivore.